It’s not your father’s NAMM Show. Or your grandfather’s or great-grandfather’s. The trade event that began in 1902 and was held at the YMCA in Baltimore as an expo for pianos — the Stratocasters of the Edwardian era — has rebranded itself more comprehensively as the world’s largest trade-only event for the music-products, pro-audio, and event-tech industry. In doing so, the Winter NAMM Show (Jan. 24-27, Anaheim, CA, Convention Center) has elbowed its way into product and technology categories traditionally covered by other shows, such as the PLASA Show, the InfoComm Show, and the AES Show, which relinquished its claim as the home of the pro-audio–oriented TEC Awards program to the Winter NAMM Show in 2011. The broader coverage reflects the blurring of lines between music production, live sound, event production, and media production in general. It has also made the event more attractive to a wider array of exhibitors, including many in the broadcast-sports arena. Although SVG sponsors Audio-Technica, Sennheiser, Shure, Sony, and Avid are longtime exhibitors at the NAMM Show, others on the sports-production side have come to see it as a positive venue for a wider range of products and platforms, including intercom-system manufacturers Clear-Com and Riedel and touring- and installed-sound developer Bose Professional. Audio-console companies like DiGiCo, whose parent company also owns broadcast-console brands Calrec and Solid State Logic, bring links to broadcast to a show once regarded as a drums-and-guitars expo. So have microphone companies like DPA Microphones and technology companies Audinate and Focusrite, all of which have extensive broadcast-facing divisions and product lines. 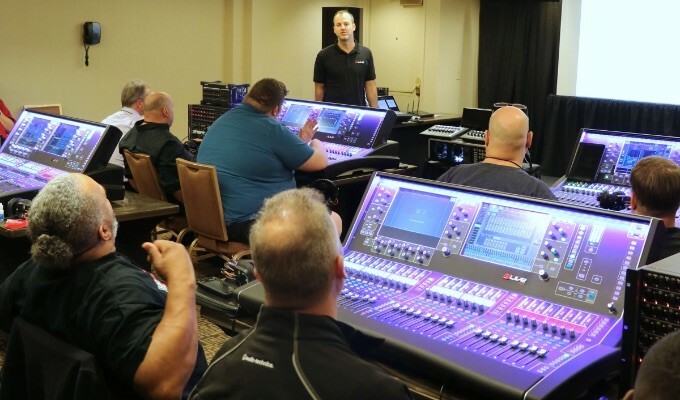 The expo’s conference programs also have extended their reach, covering a wide range of pro-audio topics. The TEC Tracks program encompasses music production, technology, business, and history and brushes against broadcast-related topics, such as loudness management, IP for audio, and control-room design. Attendees at this year’s event can expect to see an array of platforms and technologies that may find their way into broadcast applications, as well as into live sound within sports venues. Among them will be L-Acoustics’ L-ISA — the acronym is for Immersive Sound Art — which can scale from a minimum of five sound sources to as many as 64. Also, d&b audiotechnik will have d&b Soundscape, based on its Dante-enabled DS100 Signal Engine, and two software modules: d&b En-Scene, for sound-object positioning, and d&b En-Space, a room emulator that adds and/or modifies a space’s reverberation signatures. These technologies are the live-sound counterparts of Dolby’s Atmos and Fraunhofer’s MPEG-H immersive–broadcast-audio formats. The Winter NAMM Show (a smaller version is held in Nashville in the summer) is increasingly being used to launch pro-audio products. Next week, for instance, Electro-Voice will debut a flagship wireless-microphone system. Yamaha Commercial Audio will introduce its DZR Dante speaker line and Dante-enabled L2 switches. 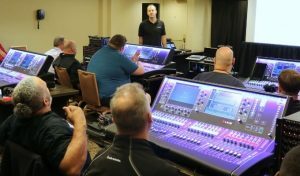 Such introductions will bring installed-sound products to the convention center’s new North Hall, which was opened last year specifically to house pro-audio exhibitors; Yamaha audio-production and live-sound products, such as its RIVAGE PM digital audio consoles, are already showcased there.